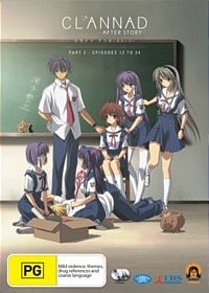 Clannad After Story Part 2: Episodes 13 - 25 DVD Review Casual viewers and those not otherwise familiar with the Clannad series may wish to start elsewhere, but for those who have lived with these characters for the past several years the current collection will certainly not disappoint..
Summer vacation is over and it’s time for Tomoya, Nagisa, their chums and hangers-on to approach graduation and - shock horror! - the onset of adulthood. The Clannad series has always been heavy on friendship and the forging of meaningful interpersonal and familial bonds, and this time around sees these themes intermingling with some rather weighty subject matter and no small smattering of tragedy. The narrative once more shifts its focus between central and peripheral characters to good effect, and with ten or so episodes proper and a couple of bonus outings there’s no shortage of space for Clannad’s writers, by this point at the top of their game, to bring things to a satisfying and meaningful conclusion. Though I’m the opposite gender and a decade or more older than the target demographic, and otherwise prefer my anime to be based on a manga series I’ve actually read (Chobits), downright insane (Irabu’s Office) or replete with oodles of gratuitous fan service (Ikki Tousen, Girls Bravo), I must say I rather enjoy Clannad. It’s always a cogent and charismatic exercise in first rate high school melodrama, and combines cleverly written, believable characters with just enough tweeny cuteness to avoid becoming mired in pointless pathos. After Story Part 2 is a fitting and compelling conclusion to the Clannad journey thus far, and handles the closing of certain chapters in its characters lives and the possibility of new beginnings with equal aplomb. Once more the animation is superb, with textured, luminous backgrounds neatly complimenting the strong character designs, and though only two-channel audio is on offer both the English and Japanese dubs are solid and the voicework excellent. Casual viewers and those not otherwise familiar with the Clannad series may wish to start elsewhere, but for those who have lived with these characters for the past several years the current collection will certainly not disappoint.